This page is devoted to a slide show of the 400 Fete, part of the celebrations of 400 years of education in Farnham. There is a separate page on the College Copse, using information kindly supplied by Nick Blackman. Most of the photos are scanned from a large number of slides taken by Keith Harvey (Geology) and recently loaned to us. If you have any photos of the event please let us know so they can be added. Here is the flyer advertising the Fete. Many of these were posted on car windscreens on the morning of the fete, courtesy of John Crotty's lorry taking a number of us on a whistle stop tour of Farnham's car parks. If memory serves us right, the fete clashed with a similar event hosted by the Phyllis Tuckwell Hospice. Nevertheless the photos show large numbers of visitors to the event. 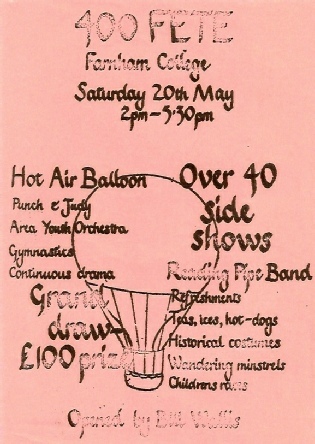 The balloon shown on the flyer was inflated but did not take off due to the wind. So far we have traced no photos of the balloon. The Fete was opened by comedian Bill Wallis, an ex-pupil of the Grammar School, and well-known at the time for his appearances on Radio 4's satirical show "Week Ending"